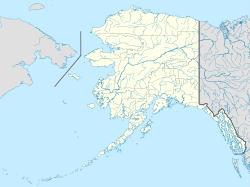 Eek is a town in Alaska. It is about 400 miles west of Anchorage. The name comes from an Eskimo word that means "two eyes". ↑ "Directory of Borough and City Officials 1974". Alaska Local Government (Juneau: Alaska Department of Community and Regional Affairs) XIII (2): 31. January 1974. ↑ 2015 Alaska Municipal Officials Directory. Juneau: Alaska Municipal League. 2015. p. 56. This page was last changed on 13 June 2018, at 14:49.